Houston is typically associated with oil – not art, with commerce – not contemplation. 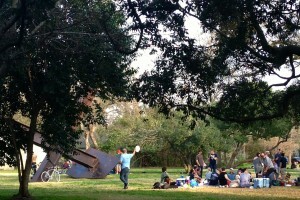 But they came together in the Rothko Chapel. It was oil money that enabled this unique sanctuary for meditation. And a whole set of museums in Houston. Houston art patrons Dominique Schlumberger de Menil and John de Menil built the chapel in 1964 and commissioned noted modern artist Mark Rothko (1903-1970) to “create a sacred place” with his paintings. Dominique was heir to the Schlumberger oil-equipment fortune. And John, a banker, became president of two Schlumberger branches. Barnett Newman’s sculpture, Broken Obelisk, a gift from the de Menils in honor of Martin Luther King, stands in a reflecting pool in front of the Chapel. 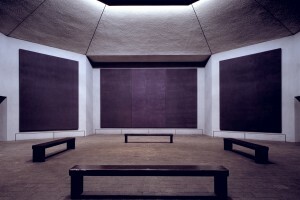 The Rothko Chapel, located in the museum district in Houston, is a fairly small place. 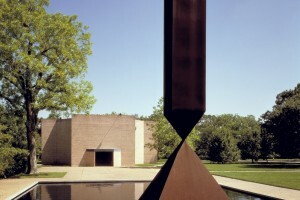 Rectangular on the outside, octagonal on the inside, its eight walls are home to 14 huge Rothko paintings. They’re somber – black and barely perceptible purple. No one knows exactly what he was thinking or why he chose those colors. (The de Menils gave him artistic control). The Chapel is located in the museum district, home to several museums funded by the de Menils, with parks and green space to relax. Visiting the Chapel requires you to be more than just a viewer. It’s not a place just to quickly walk through and glance at the paintings. Being there requires you to engage. All this black…. Is it intended for you to contemplate the great abyss? To meditate on the subtleties of the universe? To recognize the darkness of life and emerge into the Houston sunshine committed to bringing light into the world? Contemplating the massive black canvases with their hints of royal purple requires your participation – attending with your mind, heart, and soul. And that takes courage. To this end, the Chapel offers presentations, films, dialogues, and concerts throughout the year to “elevate the spirit.” When/if you’re in Houston, it’s definitely worth a visit. Copyright by Bojinka Bishop. March 30, 2104. Photos of the Chapel courtesy of Thuy Tran and the Rothko Chapel.